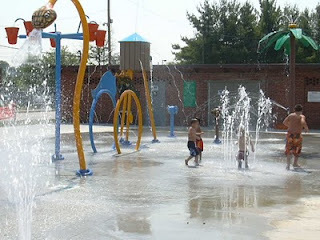 Thanks to all who attended the Splash Pad Opening yesterday! About 350 people attended and helped make this exciting Ford City event a success. Special thanks to the volunteers who made the day run smoothly. Special thanks to all those who donated resources to make the event a hit. If anyone has pictures of the celebration they would like us to post on our page please e-mail them to fordcityrenewal@gmail.com. Here is an article from the Windsor Star detailing the splash pad! Grab you sunglasses and come check out the grand opening of the Drouillard Park Splash Pad! Bring your sunscreen, towels and lawn chairs and join us! The fun starts at 4pm with a ribbon cutting at 4:30pm and the film plays after the sun goes down (9pm). The entire celebration will happen in the Drouillard Park. This free event is sponsored and/or organized by East Windsor Co-Generation Centre, New Song Church, Abundant Life Assembly Windsor, Drouillard Place and Ford City Neighbourhood Renewal: A Community-University Partnership.